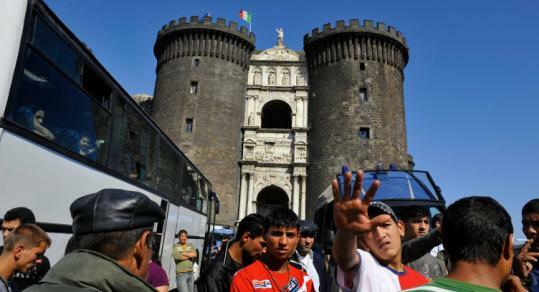 ROME - Underscoring the new Italian government's determination to crack down on illegal immigration and crime, the authorities this week arrested hundreds of people in a massive sweep of shantytowns in major urban areas across the country. The police said Wednesday that 118 people were immediately expelled and nearly 400 arrested. An additional 111 were accused of immigration crimes - 180 on thievery or prostitution charges, and 92 connected with drug dealing. Those arrested yesterday included 50 Moroccans and 32 Romanians. The widely publicized raids were a signal from Italy's new rightist government, which includes the anti-immigrant Northern League Party, that it planned to pursue tougher policies toward immigrants. "The anti-immigrant sweep was a positive thing, because that's what people want," said Umberto Bossi, the new government's minister of institutional reforms and federalism. "People ask us for safety and we must give it to them." The raids reflected a growing anti-immigrant sentiment among electorates and governing rightist parties in European countries from Italy to France and the Netherlands - a sentiment that has in part grown out of the Continent's economic stagnation. "Never again, illegal immigrants under your house!" proclaims the platform of the People of Liberty Party, which won Italy's national elections last month. It went on: "Empty illegal camps and get rid of nomads who have no residence and no means of subsistence." Just this week a crowd of several hundred Italians attacked a Roma camp on the eastern outskirts of Naples, brandishing sticks and throwing firebombs, after a 16-year-old Roma girl was accused of trying to steal a baby. "Out, out!" they yelled, according to Italian news reports. "You're dirty and smelly and rob babies." But as of 2008, such anti-immigrant sentiments have become harder to square with the European Union's open-border policy, which gives EU citizens the right to settle anywhere within its member states. In January, Bulgaria and Romania were admitted to the EU and their citizens can now live legally in Italy without any special permit. The vast majority of Roma have Romanian passports, though Roma represent only a small fraction of Romanians in Italy. "The Roma, as well, are European citizens, and as a consequence of that their rights should be assured," Cristian David, Romania's interior minister, said at a conference in Rome yesterday about the police sweep. Maria Mocanu, president of the League of Romanians in Italy, said: "It is not acceptable that, because of a few hundred people, the image of a million Romanians who live in Italy, not to mention the image of an entire country, Romania, is receiving such damage." There are an estimated 670,000 illegal immigrants in Italy.